Source: International Communist Review, Issue 7, 2017. Hundred years have passed since the Great October Socialist Revolution triumphed on the 7th of November 1917. The Hungarian Workers' Party celebrates the Great October as an outstanding event of the universal history, an event that had a decisive influence on the world, the international workers' movement, and also on Hungary and the fate of the Hungarian workers and toiling masses. 1917 provides a lot of experience and conclusions for the communist and workers' movement. The conclusions of the Great October are still valid, they serve as a guide for any political force which is fighting against capitalism, in order to construct socialism. On the other hand, the rejection and revision of 1917, the re-evaluation of its importance has always been the tool of anti-communist, revisionist forces. The conclusions of the Great October have been revised by the 20th congress of the Communist Party of the Soviet Union (CPSU), and the 22th congress of the CPSU validated these key points borned under the influence of revisionism in the party's programme. These decisions had grave consequences for the entire communist and workers' movement, its effects can still be felt. The Great October was a socialist revolution. The contradictions of capitalism cannot be resolved within the framework of capitalism, capitalism must be replaced by a socialist society. The path to this is the socialist revolution. The Great October opened the epoch of revolutions. This great epoch is still not over. There were and there will besuccesses and failures, the times of revolutionary recession and periods of revolutionary upsurgeare followingeach other, but this process ultimately leads to the victory of socialism on a world scale. Now we witness bigger and bigger wealth concentrating in the hands of fewer and fewer people, growing poverty for more and more people, growing population and more and more deteriorating natural environment, increasingly destructive military technologies concentrating in the hands of fewer and fewer, better and better technical opportunities and weakening democracy – those are contradictions, which cannot be resolved by capitalism. The Great October was the revolution of the working class. The position of the working class has changed a lot in the recent decades. The internationalization of capital and capitalist competition lend impetus to the concentration and centralization of capital and this development leads to changes in the social structure, while the strengthening of the monopolies sharpens the problems, exerts pressure on and destroys a section of the middle strata. Still the working class in the broad sense of the word - the social class which owns no capital and must sell its own labour power - today too is the most conscious force in the fight against the capital. The Great October proved that among the various currents in the labour movement only the revolutionary, radical line, the communists assume the responsibility and are able to carry out a socialist revolution, only Marxism-Leninism is a reliable ideological weapon. In the epoch of socialist revolutions the communist and social democratic currents completely and finally broke up. Communists became the carriers of socialist revolutions, while social democracy irrevocably committed themselves to capitalism . Against the will of the masses – no matter how organised a small revolutionary group is – no victorious revolutuon is possible. But no matter how much the people wish for a revolutionary change, it's not possible without an organised and disciplined party. The prerequisite of the party’s success is the adherence to Marxism-Leninism. The basis of the communist party’s strength is its ideological purity and the unity of policy and action. While the basis of the party’s ideological purity is the acceptance and creative application of Marxism-Leninism. Proletarian internationalism and the international unity of the communist parties are important prerequisites of the success of the revolutionary struggle. Shortly after the victory of the Great October, in the March of 1918 the 3rd Internationale started its work, the 3rd Internationale was so far the biggest institutionalized cooperation in the history of the communist movement. The importance of proletarian internationalism is not decreasing. Only together communist and workers’ parties can defeat the forces of capitalism. Socialism should oppose the forces of capitalism with a compelling power. Peaceful co-existence does not mean reconciliation with capitalism but is one of the forms of struggle. Capital has never forgiven the revolution of 1917. From the first moment it tried to get revenge, to get back its lost positions. We Hungarians rememer well, that in 1919 the Soviet Republic was drown in blood and Miklós Horthy was put into power for more than two decades. In order to eliminate the Soviet Union and communists, the capital unleashed fascism on the world. Without the support and the money of the European big capital there would have never been any Hitler or Mussolini. Capital didn’t care that fascism caused wars and the death of tens of millions. Capital still hasn’t completely lock back the spirit of fascism into the bottle, but takes it out everytime it’s needed. Capital started the cold war (1948-1990) in the name of revenge, and toppled socialist systems in several countries in the 1990’s. In this specific period there was at the same time an opportunist corrosion of the CPs and violations of the laws of socialist construction, which formed conditions for the counterrevolution. A milestone in this course were the decisions of the 20th Congress of the CPSU. On 14-25 February, 1956 the 20th congress of the CPSU took place. 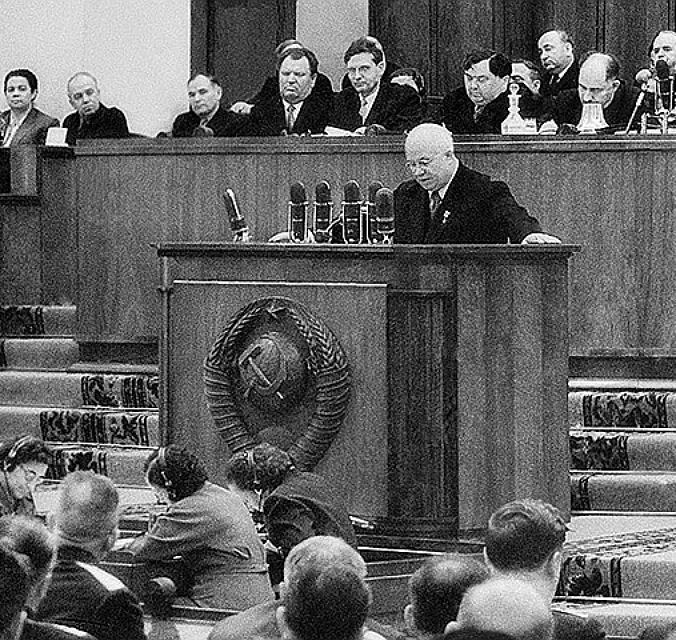 The congress was a turning point in the history of the Soviet and the international communist movement. It revised the most basic lessons of 1917. Its decisions determined the way of thinking and the political practices of the communist movement for a long time. Instead of 1917, the historical reference point became 1956, the 20th congress. The reference point in evaluating the debates within the Soviet party started to be the attitude to the 20th century, not to 1917. This determined the relationships with the different communist parties too. The CPSU tried to make the postulates of the Soviet political thinking to be accepted as dogmas in the international movement, and had much success with it. This largely held back creative thinking. It strenghtened the position of petty bourgeois-opportunist forces within the leaderships of socialist countries. This period concided with the changes in the basis of the Western European communist parties, the increasing influence of intelligentsia, the decreasing proportions of actually workers. In Europe eurocommunist parties emerged, which rejected the revolutionary effect of the Great October and the experiences of socialist countries, absolutised the peculiarities of Western European countries, revised the basic principles of Marxism. These views still have a damaging influence on the European communist movement, obstruct the fight of the workers. They reached the point of irrationally and unscientifically arguing that socialism could be constructed through bourgeois parliamentary elections and using the tools of capitalism. The 20th congress of the CPSU also has played a considerable role in destroying the earlier existing unity of the socialist countries. From the 60’s the relationship between the Soviet Union and China became hostile. The positions of China were utilized by US and European imperialism against the Soviet Union. The 21th extraordinary congress of the CPSU took place between January 27-February 5 1959. Its task was to strenghten the changes in the CPSU’s leadership and Nikita Khrushchev’s power position and to make the elaboration of the CPSU’s new programme quicker. 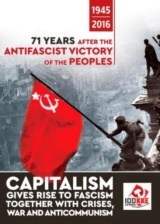 The CPSU’s 22nd congress on October 17-31 1961 accepted the new programme of the CPSU, and thus implemented a revision of the conclusions of 1917 on the level of the party programme. 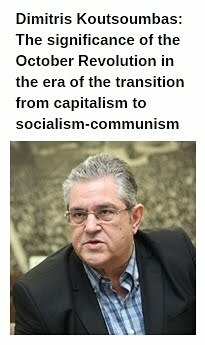 In the last decades the Marxist re-evaluation of the CPSU’s 20th congress has begun in the communist movement. The Hungarian Workers’ Party declared on the 90th anniversary of the Great October: „Capitalist counter-revolutions would have been impossible or very hard to carry out, if there hadn’t been internal causes in some of the socialist countries. The decisive internal cause should be looked for in the leaderships of the socialist countries, where a reformist-opportunist wing emerged and gradually gave up its socialist positions. This political line was felt already after the CPSU’s 20th congress, when several values of socialist construction were rejected with the pretext of eliminating the mistakes of the Stalin-era. The justified and correct criticism of Stalin was used to reject the positive elements of his heritage, to deprive the socialist countries’ societies of the reliable historical consciousness. Evaluating of Stalin according to today’s circumstances, correcting the distortions is the duty of our time”. Let’s examine closer the most important questions, in which the CPSU’s 20th congress changed the evaluation of the Great October experience! 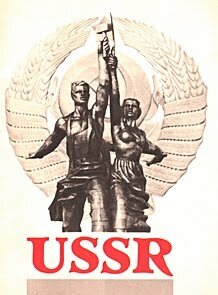 Following a certain detente in the middle of the 1950’s and the gradually established military balance between the Soviet Union and the USA the CPSU’s 20th congress thought that the peaceful coexistence of the two systems means a broad cooperation and the aspect of anticapitalist fight can be put aside. The congress was right to conclude that there was a certain detente. The congress correctly concluded that the existence of the two world systems is a fact, which determines international relations. The congress didn’t speak about the fact that this relative detente between the two world systems was mostly a result of the military balance formed due to the developments of the 1950’s, the creation of the Soviet atomic and hydrogen bomb, the great successes in rocket research. The congress overlooked the internal problems of the socialist countries. We shouldn’t forget that in 1956 counter revolutionary processes take place in Poland and Hungary. 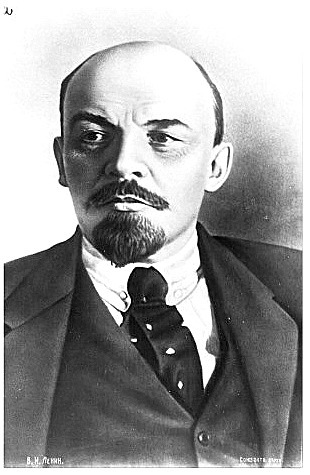 Lenin was a supporter of the world revolution. For Lenin peaceful coexistence was a temporary compromise: I can’t defeat capitalism now, but I don’t give up the goal. In March 1919 the Communist Internationale was formed, which enjoyed the full support of the Soviet state. In the 1920’s communist parties were created in almost every country of the world. At the period when Stalin was the general secretary of the party the CPSU supported the Comintern. Though in 1943 they made a gesture to the capitalist members of the antifascist coalition and dissolved the Comintern, by then there was already a new, effective force of the world revolution, the triumphantly advancing Red Army. 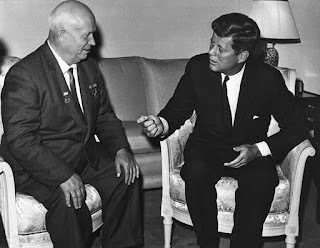 The CPSU under the leadership of Khrushchev gives up the idea of world revolution, he declares peaceful coexistence as the end goal, stating that relations of capitalism and socialism would be determined by peaceful competition. Brezhnev a bit clumsily, but returns to the idea of world revolution. Of course, this does not negate the fact that in the period when Brezhnev was the GS of the CPSU the problems of utilizing the tools of capitalism in socialist construction continued and sharpened, with the result that the party lost its revolutionary way with grave consequences. 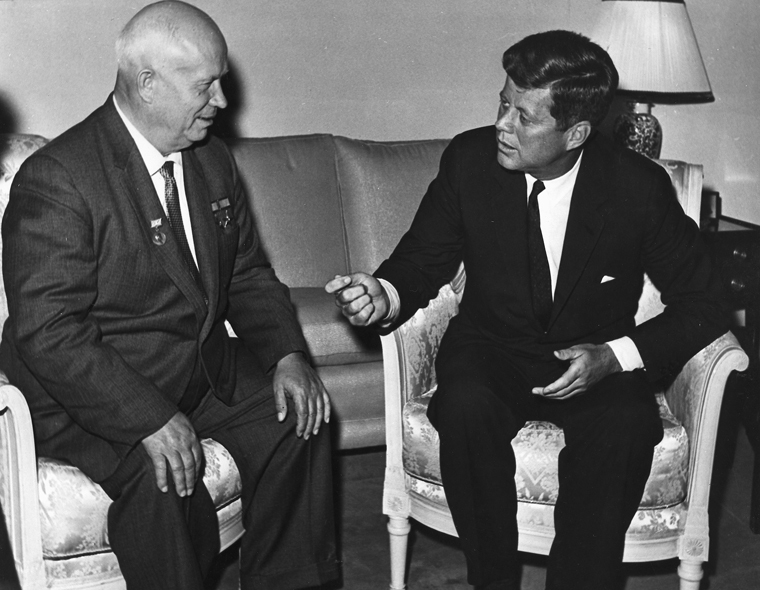 Gorbatchev’s „new way of thinking” meant giving up the goals of socialism. He gave back the territories gained in WW2, ruined the Soviet armed forces, left socialist countries at the mercy of the forces of capitalism. 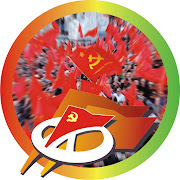 This was one of the biggest theoretical misconception of the CPSU’s 20th congress, which explained many political steps that contributed to the weakening and then toppling of the socialist system. This was the false and incorrect interpretation of the principle of peaceful coexistence. Socialism will win on a world level if it produces more and better in economy, than capitalism does. But this doesn’t mean that military power can be given up. Based on the false and incorrect interpretation of the principle of peaceful coexistence, the Soviet Union reduced a significant portion of the land and naval forces in the beginning of the 60’s. From the end of the 60’s it signed a number of agreements on the limitation and reduction of armaments and disarmament with the USA, that broke the delicate military balance which was so hard to establish, and more than that - made the Soviet Union vulnerable. This doesn’t mean that disarmament efforts weren’t needed, but it’s a fact that it led to the end of military balance. The mistake was not the disarmament, but the series of one-sided concessions to the US. Without the military power balance the socialist world became vulnerable on all other fields too, as the military balance had the greatest impact on capitalist countries. The 20th congress of the CPSU declared that in the changed international conditions communist parties can get into power by parliamentary elections and can make socialism win. „... the present situation offers the working class in a number of capitalst countries a real opportunity to unite the overwhelming majority of the people under its leadership and to secure the transfer of the basic means of production into the hands of the people. The Right-wing bourgeois parties and their governments are suffering bankruptcy with increasing frequency. In those circumstances the working class, by rallying around itself the toiling peasantry, the intelligentsia, all patriotic forces, and resolutely repulsing the opportunist elements who are uncapable of giving up the policy of compromise with the capitalists and landlords, is in a position to defeat the reactionary forces opposed to the popular interest, to capture a stable majority in parliament, and transform the latter from an organ of bourgeois democracy into a genuine instrument of the people’s will. (Applause.) In such an event this institution, traditional in many highly developed capitalist countries, may become an organ of genuine democracy, democracy for the working people. The CPSU’s thesis about the parliamentary way creates serious illusions in the workers’ movement. Many parties completely settle for election work and performance in the parliament. Some of the parties forget that the fight for the interests of workers, working people is a constant task of communists. Taking part in the parliament is not the goal for a communist party, but only a tool. We don’t know which year, which month and which day the new socialist revolution will win. But we know that it will win. It will win when the majority of the people understands through their own experiences that there is only one way to happiness, the new popular socialist revolution, and they will be willing to make an effort for it. The CPSU’s 20th congress declared that in order to prevent a world war, the strategic cooperation of communist and social democratic parties is necessary and possible. Social democracy in the 19th century grew from the working masses of the capitalist countries, the trade union movement. They also dreamt about socialism, like communists, but in a long-long term, and on a daily basis they wanted to end the unfairness of capitalism, to make capitalist order nicer. Revolutionary Marxists never agreed with that, as capitalism, even in its best, most democratic and richest form is built on the exploitation of the working masses. Revolutionary Marxists always aimed for the creation of socialism. But after the WW2 social democracy has undergone an essential change. There was plenty of money in the course of growth of general european well-being after the war. This made it possible for capitalist social democratic parties to give more to the masses, to create the so called „the welfare state”. In turn, the existence of the socialist world, where masses had the right to work, rest and access to free health care, forced the capitalist parties to do so. The so called „welfare state” in reality meant that a minority of rich peope lived on a very high standarf of living. The middle classes and a part of the working masses got much better conditions than before. The standard of living of large masses of working people, not speaking about the rising number of foreign migrants changed only to a limited degree. After the economic difficulties of the 80’s they had less money. The socialist world collapsed, the external coercive force disappeared. Capitalist governments gave up the generous policy of the so called „welfare state”, and social democracy in turn declared the concept of the 3rd way. Since the 80’s socialism is not the goal, and they even gave up the previous traditional demands of social democracy and started to carry out neoliberal policies. Social democracy played a significant role in undermining, weakening the socialist countries.. Under the slogans of the „Ostpolitik”, the „disarmament” and the „European cooperation” they actively took part in the preparation of the counter revolutions of 1989-91. In the former socialist countries several parties emerged under the name socialist or social democrat. These parties are fundamentally different from Western paries because they have no social democratic past at all, no trade union background, they are not connected by their traditions to the workers. These parties, including the Hungarian Socialist Party (MSZP), from the first moment have been active participants of the capitalist counter revolutions of 1989-91, and became one of the pillars of the capitalist system. Their task is to mislead and manipulate working masses, to stabilise capitalism. Experiences of the revolution in 1917 and the 90 years that have passed since clearly show that the goals of communists and social democrats are fundamentally different. Experiences of Hungarian history prove that Hungarian social democrats betrayed the interests of the workers in 1919 and in 1898-90 as well. They gave up the communists to the gendarmerie of the Horthy-era and even nowadays they do not shy away from legal and governmental attacks on communists. The 90 years since 1917 clearly show: if communists under conditions of capitalit system cooperate with social democrats in strategic questions, if they govern together, then this is always the communists who „pull the shorter” and who pay the biggest price. The leadership of the CPSU after 1956, seeing the successes of socialism, made a false and in retrospect fatal conclusion: the victory of socialism is final and irreversible. 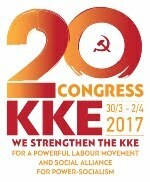 The 22nd congress describes the party’s new strategy, the construction of the communist society. The decision of the CPSU was a strategical mistake which affected the other socialist countries too. After the 20th congress they increasingly underestimated the necessity of class struggle. 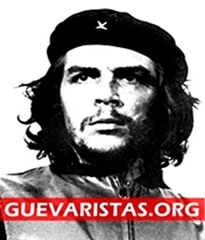 They disregarded the fact that the representatives of the old ruling classes and their descendants were still alive, the implementation of the elements of a market economy contributed to the revival of the bourgeois forces. Parties were not prepared for actual class struggle. Later under the flag of Gorbatchev’s perestroika, glasnosty, modernisation, rapprochement with Europe they introduced multi-party system, allowedand even helped the activity of the parties which were against socialism. With the false slogan of depolitisation they took out the army and the national security organs from under the control of the party and the people. System changes were prepared and carried out almost everywhere by reformist-opportunist forces. These forces deliberately crossed the border, beyond which we are talking not about the reform of socialism, but about the introduction of the capitalist system. 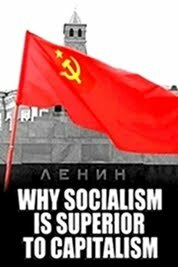 The socialist revolution in Russia in 1917 confirmed the correctness of Marxist-Leninist theory on the inevitability of the socialist revolution and the transition of humanity from the capitalist economic system to communism, the first phase of which is socialism. 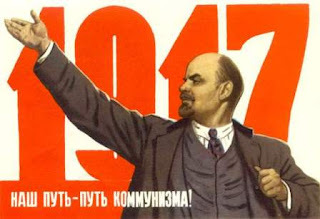 It was in October 1917 in Russia that a great historical epoch of transition of humanity from capitalism to socialism started. Today, as never before, it is clear: The great October socialist revolution – the main event not only in the 20th century, but in the whole history of mankind, the event that showed the way of progressive development for many decades to come. In the result of the Great October revolution was dispelled the myth of the eternity of capitalism, capitalism ceased to be a world system. Since that time in the world exist two opposite social-economic systems, the struggle between them became the main form of manifestation of the main contradiction of the modern era – the contradiction between labor and capital. The Great October inseparably interwined with the memory of the 20th century Hungarian socialism too. The successes of socialism proved that the Hungarian workers, the working people can manage being in power, creating a better life for millions, secure the survival and development of the Hungarian nation. Hungarian workers can still be proud of those decades, can draw strength to fight against capital system. This is the legacy of the Great October. There was a lot of good in Hungarian socialism, though not everything was good. But undoubtedly there were much more things that could have been called successes, results. And it’s also beyond doubt that despite all its problems and mistakes that socialism was better, more successful and more humane than today’s capitalism. The Hungarian Workers’ Party is following the footsteps of the Great October. We want socialism. We have learnt from the history of socialism. We are convinced that a new socialist society will give even more and even better. * President of the Hungarian Workers’ Party. Report of the Central Committee of the Communist Party of the Soviet Union to the 20th Party Congress. Foreign Languages Publishing House. Moscow 1956. Page 7.